Since I have spent way to much time messing with this already, I thought I should spotlight this new addition: Lotus 1-2-3G 1.0 Beta Build 2 for IBM OS/2. Hopefully everyone here knows of the famous DOS-based Lotus 1-2-3 spreadsheet program. While Microsoft was busy porting their products to Windows, Lotus was hard at work porting to OS/2. OS/2 was supposed to be the future - even Bill Gates himself stated that "OS/2 would be operating system of the 90s". Sometimes it makes me wonder if Microsoft's sudden direction switch from OS/2 to Windows was really intended to shake off competition. This was in very early 1990. OS/2 was only still at 1.x and Windows 3.0 had not come out yet. Lotus already had issues making their products available for other platforms. One of these days I'll write something up about the infamous "Lotus Jazz". The actual 1-2-3 Macintosh version would not come out until 1991. 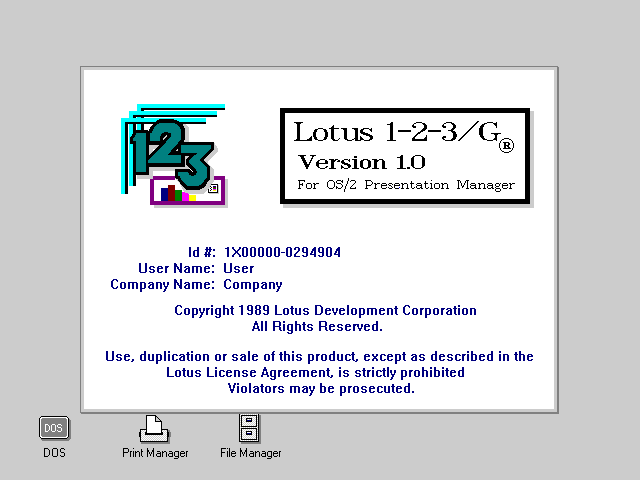 Lotus already had a character-based OS/2 version of Lotus 1-2-3 Release 3.0, so "1-2-3G" was their attempt at bringing 1-2-3 to the native Presentation Manager GUI. The added version is a pre-release, but the really odd thing about this release is that it is COPY PROTECTED! I'm not familiar with any other copy protected OS/2 products. The protection method is fairly simple. It uses mis-numbered duplicate sectors on the last track. But the catch is, I don't know of any emulators that can BOTH run OS/2 and support this kind of copy protection. I tried 86Box, as it does run OS/2 and accepts ImageDisk and Teledisk formats, but it would always barf on the images. There might still be some way to coax the images in to some other format it accepts, but I could not find out how to do that off hand. Since I wasn't sure how reliably that would work anyway, I loaded up an OS/2 1.3 image on real hardware. Surprisingly the Kryoflux created Lotus 1-2-3G disks installed OK. On emulators 1-2-3G would stop after the first page of the install complaining that the install disk was not original. Install seems to write the user name and company name to the disk. Unlike some later protected Lotus versions the copy protection remains in place after installation. The copy protection consists of some duplicate sectors that occupy the hidden file "LCD|||88.123". It may be that the program does not access the disk directly but just opens the file and checks to make sure the content is different each time. I can't tell for sure if it "protects" anything on the hard drive, but the protected disk is only required during installation. There was no user name already present, so it looks like this 1-2-3G pre-release copy was unused. Now, here is another interesting issue: The "Lotus 1-2-3G 1.0" download that had already been on Winworld was actually Lotus FreeLance Graphics 1.0 for OS/2. I guess nobody ever checked that... because these disks are supposed to be COPY PROTECTED TOO! The Freelance Graphics 1.0 for OS/2 disks were only dumped as raw sector image files, stripping it of its protected track. This means no one could have even tried to install it. The installer complains the install disk is not original. However, on a hunch, I tried placing the Freelance Graphics install files on the protected 1-2-3G install disk - not replacing only the "LCD|||88.123" files. Somewhat surprisingly, it installed! These two products are interrelated and share code. In fact they seem to both have the exact same Graphing capabilities. 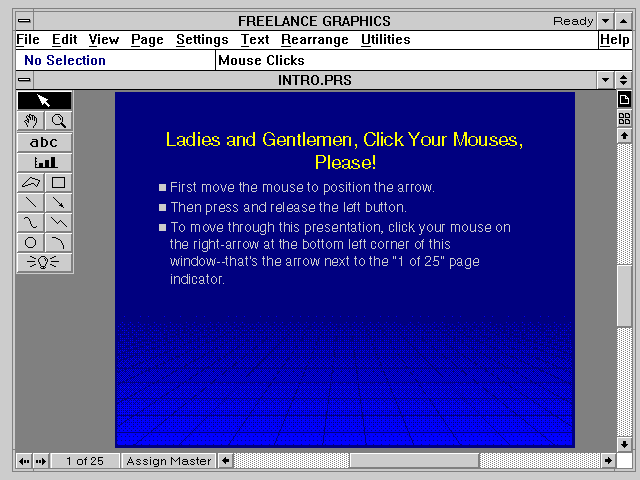 However, while 1-2-3 is a spreadsheet, Freelance Graphics is a presentation program similar to PowerPoint. It is quite interesting to see such an application running on early OS/2. 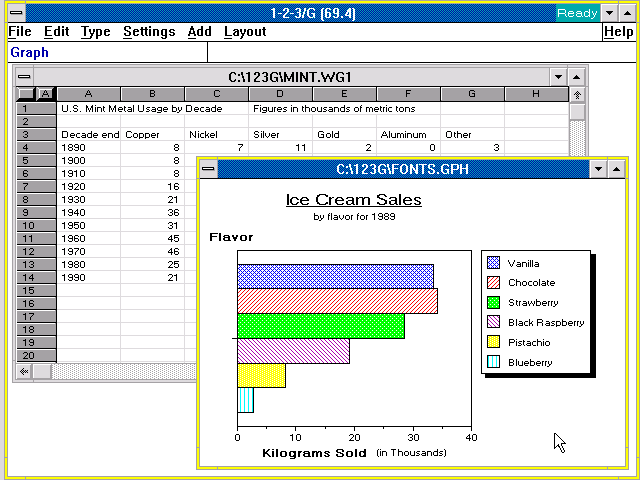 Microsoft also ported Excel to OS/2 1.x, but not PowerPoint. So we actually need a dump of the final Lotus 1-2-3G 1.0 release. Lotus continued to support OS/2 for quite some time, and then was eventually bought out by IBM. IBM continued to include 1-2-3 in Smartsuite. It appears the last Lotus 1-2-3 version for OS/2 was with Smartsuite for OS/2 Warp 4. No emulators were harmed during the making of this review. However, sometimes virtual machines can leak data if you're not careful with security (viruses in a VM can sometimes breach and then affect the host ). Copy-protected OS/2 software? Now that is new. This copy protection will be removed once user install or register the program. But this copy protection is on 5.25" 2HD media. Actually, in this case the copy protection stays in place, even after it is installed. I checked that with my Kryoflux after using the disk. And Install will still check the protection even if a user name is already written. I ran this all on real hardware since no emulator would work. Hence the "no emulators were harmed" remark. Easy way to defeat the copy protection: Copy the contents of each disk to a folder on your hard disk (I just used c:\123 since the installer wants to install to c:\123g), then run install.exe from that directory. Everything runs smoothly. Tested on OS/2 1.3 IBM EE with the last CID installed. @sjp123 While your method does work for 1-2-3/G, it sadly doesn't work for Freelance Graphics. After install I just get the error: "You must run install before using this product". I'd also expect that to not work on the final 1-2-3G 1.0 release. Still good to know it works in this case. It looks like this only works because they left registration information strings in the beta files. Thought I tested that with no success but I may have been using the Freelance files. Yep, I'm having the same problem installing FLG. Maybe the original poster can give us some ideas about what changes the installer should make. Apart from copying the files, the only change I see is the libpath. I've tried copying the "LCD" "hidden" file too. I've also tried installing 123G and FLG in the same folder (as recommended by the FLG readme) and in different folders.